With the revitalization of the Winnipeg Jets in the NHL, it seems there's a lot of team following suit for the old names coming back. Today, the Trenton ECHL franchise decided to come back from their three-week hiatus (the Devils sold the team and put them on hiatus until things were signed) and will be named the Titans, much like they were named before the Devils rebranded them into the Devils. I'll pause this now to say that while I don't like the idea of the Jets name being used because it's not the actual original Jets team being brought back to Winnipeg; the Titans name is okay by me, because it's the old Titans organization that's being used. And that's the story of Flag Day. While we all know that people in hockey yearn for the Hartford Whalers and Quebec Nordiques to come back; what better way to actually regale people of minor league teams past and the names I'd like to see back into the fold for the lexicon of sports. It's late July folks-- what do you want out of me?? Miami Matadors: While this team was only a one-year team, it showed that you can have stereotypical names in the late-90s to try and garner an audience. However, the Matadors were only around for the 1998-99 season where they went 28-32-10 and missed the playoffs, but the jerseys and logo were fantastically comical. Kentucky Thoroughblades: A great pun team name, that captured the essence of the Lexington area with the horse-racing nod into the name. Not only that, but the color scheme of green, purple, and silver could be one of the most diverse color scheme to have appeared in any league. If nothing else, the history can tell that Miikaa Kiprusoff, Dan Boyle, and Zdeno Chara all sported the Thoroughblades logo on their chest. Orlando Solar Bears: Another puntastic name, but this could be the most successful of the defunct teams, with many IHL Finals appearances and even a Turner Cup championships. However, the fact they had a polar bear with sunglasses on was a nice combination of the sun and hockey aspect of it all.....or a comment on global warming and polar bears being displaced in their habitat. Either way. Phoenix Roadrunners: While this team wasn't really know as something special, but it's a name that has been with the Phoenix area forever, being in several leagues-- including the WHA, IHL, and ECHL. The name has always stuck around. Plus, if the Coyotes stick around-- we could have the Warner Brothers annual game between the Coyotes and Roadrunners. Macon Whoopee: This is the TOP of the list. Not only is it a great pun, but it's a double entendre. Not only was it fancy to have a whopping crane as their logo late into their existence, but the whole 70s raunchy game-show/sitcom vibe to it. The team itself had ups and downs during their CHL and ECHL days, but the name is what brought people in. The ACHL/SPHL off-shoot of Macon Trax is nice for a small snicker, but nothing like the Whoopee. These are only a couple of teams that I'd love to see back into the fold. The big thing with the Titans is whether or not they go with the modernized retro aspect of the identity remains to be seen; but it would probably not have that much of a change of pace to it all. If you've got some old teams you want to bring back, drop them in the comments and your rationale behind it. The Edmonton Oilers want a new arena and they have about $350M of the $450M needed to fulfill the dream that owner Daryl Katz has planned out. While Katz has put up $100M, the city of Edmonton put up $125M, a user-paid facility fee has put forth another $125M; the province of Alberta has said they won't put up money to help out the Oilers plight. Yet, while the Wildrose Alliance Party has said "no" to helping out with the arena, but Danielle Smith of the Wildrose has proposed a "special lottery" to help raise fund for the arena, while those in the Progressive Conservative Party said if the city raised sales tax by just 1%, that could go towards the arena. The idea of a lottery is a grand idea, and I have to thank Roger Kingkade of "The Show" on X 92.9 FM in Calgary for bringing this idea to my ears. 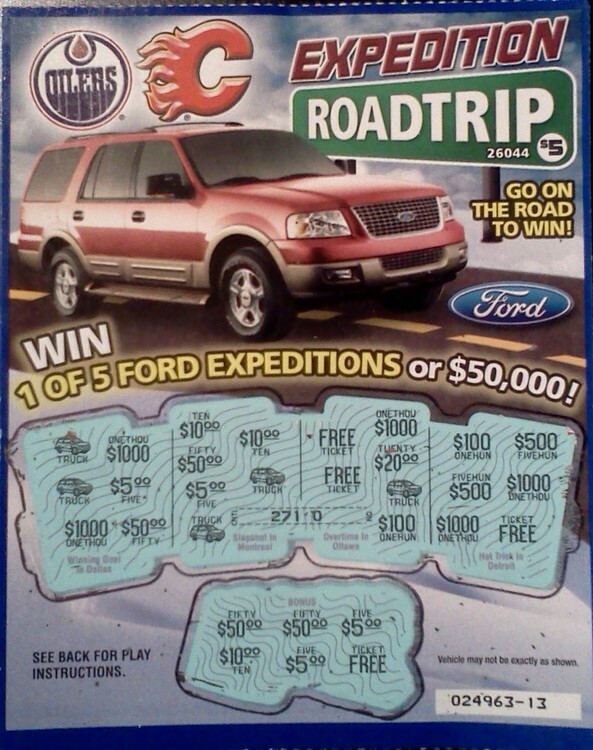 You see, the shocking thing about this is that this isn't the first time that the Oilers (and the Flames) have had a lottery in the province. 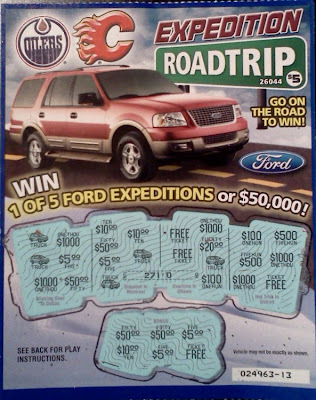 Back, let's say 2003 or so, both teams-- incorporation with Ford-- had a scratch-off lottery (the ticket is above) to help out both teams, as both were close to moving away and it was a way to get some money to help keep the team with their losses. This is something that will not only allow the fans to help out with the arena, but also they could win something here and there-- as I'm sure that local businesses would chip in a prize here and there in order to not only help out; but to get some free publicity in the process. Plus, you have to figure this is much better than the province to give up some money-- which could help the Flames leverage for funding in possibly getting a new arena-- and probably better than raising city taxes if the city had to add onto their $125M donation so far. I know if there is a lottery and if it's province-wide, I will definitely be going to get one. While I'm not a big fan of the Oilers, I would definitely support them in trying to get this money for their new arena if it means I won't have to pay more in taxes to fund it. It's better to possibly win something from paying up $5 for a ticket than possibly losing more when tax-time rolls around. With the Winnipeg Jets showing their new identity, what better chance to review the career of another Jet goalie, right?? However, while most of his appearances were in relief, he did have a decent amount of time in Winnipeg. Yet, the one thing he does share with the new Winnipeg Jets-- no wins in the NHL yet. This week, the profile of Mike O'Neill. The Montreal native forged his way with Midget AAA with the Lac St-Louis Lions starting in the 1982-83 season, playing in 20 games that season with a 7-8-5 record. The 1983-84 season saw O'Neill have a better go, finishing with a 13-7-2 record in 22 games with the Lions. After spending a year at Lower Canada College, O'Neill moved to Yale University for the 1985-86 season. O'Neill was slowly worked in at Yale, going 3-1-0 in six games during that first season; but would get increased time in the 1986-87 season, playing in 16 games with a 9-6-1 record-- taking home ECAC First-Team All-Star honors. As he took over the starting role in the 1987-88 season, O'Neill's number slipped, going only 6-17-0 in 24 games-- but it was enough for the Winnipeg Jets to pick O'Neill in the 1988 Supplemental Draft. With a team behind him, O'Neill bounced back for his season season in the 1988-89 campaign, going 10-14-1 in 25 games, which was enough for O'Neill to get yet another ECAC First-Team All-Star honors and NCAA East First All-American Team.....though it's odd since he's Canadian. While his college career was over, O'Neill didn't jump to the North American professional ranks right after that. Instead, he went overseas to play in Finland with Tappara Tampere in the 1989-90 season and got plenty of playing time, going 23-13-5 in 41 games, then going 3-4 in the playoffs. O'Neill returned to North America for the 1990-91 season, starting off with the IHL's Fort Wayne Komets and playing in eight games (5-2-1) before making the move to the AHL's Moncton Hawks for 30 games and going 13-7-6 in the regular season, while going 3-4 in eight playoff games. The 1991-92 season had O'Neill traveling a lot, starting off in Fort Wayne for 33 games and a 22-6-3 record, then he would spend a game in Winnipeg, coming on in relief for a game. The end of the season had O'Neill setting in Moncton, posting a 14-16-2 record in the regular season, then went 4-7 in 11 playoff games. 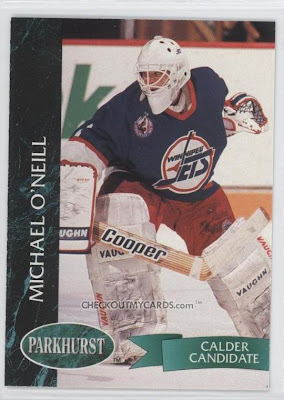 The 1992-93 season had O'Neill start off in Moncton, playing for 30 games with a 13-10-4 record before getting the call-up to Winnipeg-- playing in two games and going 0-0-1 before having to miss the rest of the season due to shoulder surgery in February. When O'Neill came back in the 1993-94 season, he went through another whirlwind traveling schedule, starting off in Fort Wayne and finishing with a 4-4-3 record in 11 games before he moved onto Moncton, going 8-4-0 in 12 appearances. Finally, O'Neill got the call to Winnipeg to back-up former AGMs Bob Essensa and Tim Cheveldae-- appearing in 17 games and posting up a dismal 0-9-1 record. The 1994-95 season had O'Neill stuck in the IHL, first with Fort Wayne, playing for 28 games with a 11-12-4 record before he was traded to the Phoenix Roadrunners. With Phoenix, O'Neill had a 13-4-4 record in 21 games, then a 4-5 record in nine playoff games. O'Neill signed as a free agent with the Anaheim Mighty Ducks and was sent to the AHL's Baltimore Bandits for the 1995-96 season. O'Neill had plenty of playing time in Baltimore, playing 74 games and finishing with a 31-31-7 record, then going 6-6 in 12 playoff games. O'Neill got a small shot with Anaheim, but came in for a game as a replacement for Mikhail Shtalenkov. O'Neill stayed in the Anaheim organization, but was shifted to the IHL and the Long Beach Ice Dogs, where he'd play 45 games and finish with a 26-12-6 record. For the 1997-98 season, O'Neill signed with the Washington Capitals, but spent that season with the Portland Pirates-- playing in 47 games and compiling with a 16-18-10 record, then finishing with a 2-3 record in six playoff contests. With no jobs in the 1998-99 season in North America, O'Neill had to sign in Austria with EC Villacher SV, who played in the Swiss league. He would play in 42 games and finished with a 2.46 GAA on the season. O'Neill would return to North America for the 1999-2000 season, signing a deal with the Los Angeles Kings, but would be placed in the IHL, first with the Michigan K-Wings for four games (1-1-0), then was moved to the Long Beach Ice Dogs, where he would go 7-12-5 in 25 games, and suffer a loss in his only playoff game. No opportunities in North America, O'Neill once again went overseas, this time with the Sheffield Steelers of the British Hockey League where he played in 30 games, finishing with a 2.39 GAA and aided the Steelers winning the B&H Cup (held at the beginning of the season), the Challenge Cup (held during the season), the League Championship, and Playoff Championship-- the Grand Slam of British Hockey championships. O'Neill would retire after that season and his whereabouts are unknown after his retirement. While it seemed he was able to get things going in the IHL, O'Neill's struggled in the AHL, with some fairly bad teams, and didn't get a chance in the NHL past a back-up. Though, he was able to see the world in North America and then overseas-- but just couldn't seem to get as successful in the other leagues as he did in the IHL and overseas. One mystery of the Winnipeg Jets have been revealed, with their logo identity being shown (as you see above), which radically different from anything they've had in the past. This identity was a nod to the relationship the city of Winnipeg has had with the Royal Canadian Air Force and the 17 Wing Squadron. The logos themselves are solid, but could be considered a little bland, which I kind of thought at first, but it's growing on me. I still think the alternate logo with the pilots wings are a little bit better than the main logo. Once the jerseys are revealed, it could change me a little more because the main one could look better on the right canvas. The wordmark is a nice little nod to the old WHA Jets, as it seems like the modernized version of their old wordmark/logo. Yet, the first thing that jumped out to me on the main logo is the self-masturbatory habit that True North Entertainment put forth on the perimeter of the logo. You see that little notch taken out of the circle surrounding the jet?? Hey, it points North....a somewhat subtle nod to their own brand within a brand of the hockey team. I understand they paid a lot of money to get a team to Winnipeg and are putting a lot of money out there in general-- but at the same time, shouldn't you leave yourself out of your team's logo?? You don't see a big "AOL" mark on the Capitals logos nor do you see the Canadiens have a Molson alternate logo....though it'd be cool. There's a time where the True North folks have to realize they don't need to their hand in everything that the team does. It's nice for them to get involved, but they don't need to have their hand in on everything. It's their team now and they can do whatever they want. Though, at the same time-- it's a touch tacky if the team itself will just be used for True North to peddle their wears and their own brand with subconscious marketing. If they screw up the possible retro jerseys with some of their branding-- that's when you'll see tables flipped. The Research and Development Camp for the NHL is coming up in mid-August. The NHL brings out some of the top junior players to test out some of the crazy schemes that the NHL has to offer. We remember last year's R&D camp that provided bigger blue lines, hybrid icings, and a giant Cyclops face-off circle in the attacking zone. As this is a giant gimmick blog, I have wondered what attempts could have been made for this year's R&D camp that didn't quite make the cut. There is some truth to the rumor that most of these ideas are from the Face Off Hockey Show tirades over the past decade. The Doubler Puck: Popularized by the old MTV Rock N' Jock series of games, the Doubler Puck would be used by a team that's down late in the game and need to take a risk for these games. 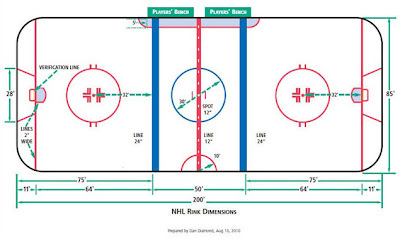 Of course, the adverse effect would be the team who wanted the Doubler Puck would be down in the hole if they get scored on-- but it's a risk you have to take. The NHL denied it because it would inflate some of the statistics, even though the ratings for the games would spike during those times. 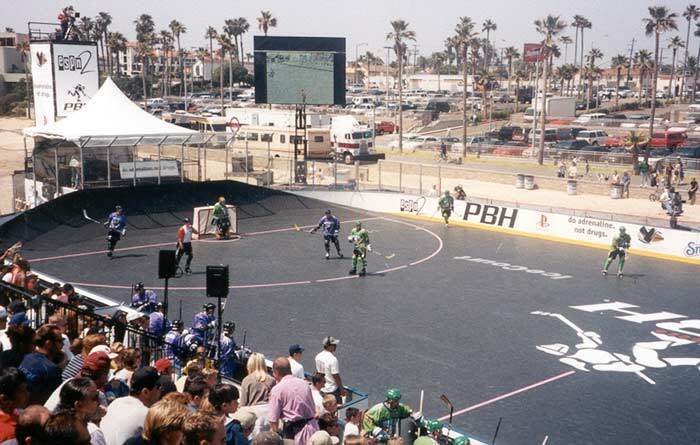 Behind-the-Net Ramps: Another bit taken from TV, the Pro Beach Hockey on ESPN had ramps behind the net to create new plays and to keep the players from stopping and stalling behind the net. While the NHL liked the continuous playing idea, the brass didn't enjoy the idea of constant stoppages from the net being off their moorings because of players not having the momentum to make it around the ramp behind the net. Plus, ice makers have said they'd go on strike and owners wouldn't want to kill the behind-the-net seating since those are primo dollars. The Three-Way Dance: To keep some costs down for the lower level teams, the idea of having three-teams played at once was pitched. This was immediately shutdown due to the rink being not only overly cluttered, but other owners claiming they would be getting shutout of revenue by missing a home game because of it. However, it would provide more bang for the buck for those there. 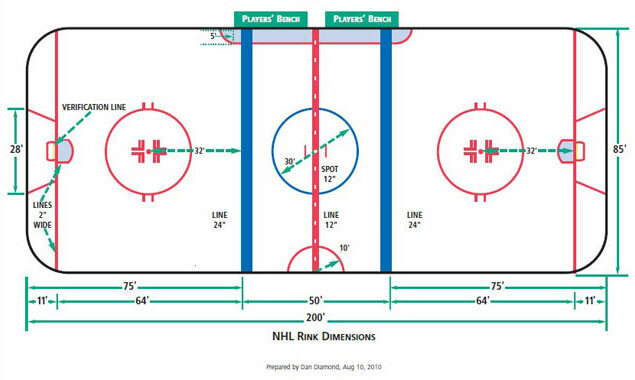 The Run-In Rule: While this would only be instituted during the playoff race late in the year, the run-in rule would allow rival teams who are battling for those valuable playoff spots to come out onto the ice late into a crucial period of the game to switch the momentum of the game and reek havoc on their opponents. For example-- if the Flyers were playing the Rangers late in the season and the game was tied; both battling for a playoff spot-- you could see two member of the Hurricanes come running onto the ice and create havoc for both teams, possibly costing them valuable points in the end. Somewhere, Vince McMahon is reading this and smiling. Speaking of McMahon, he could use these all for his XHL that he'll get started when he realizes there's a market for something like this to rival the NHL and create the extreme side of things. Yes, these are silly-- but it's oddly not out of place for the R&D side of things, so it's not too far fetched in the end. It took what seemed forever, Steven Stamkos finally re-signed with the Tampa Bay Lightning to the tune of five-years and $37.5M ($7.5M cap hit). It was something that you knew was going to get done sooner or later and Steve Yzerman did it right; pacing things and letting it all play out how it needed to. It's a solid price for a kid who is already a star and should be solid for the Bolts in the long-run as well. Plus, the move leaves about $7M in buffer room for the Bolts against the salary cap. That said, still no word on the other highly touted RFA, Drew Doughty of the LA Kings. Though you can bet that will be under the microscope moreso now with Stamoks signed. In what could be considered a decent coaching swerve, the New Jersey Devils didn't go with Guy Carbonneau or Ken Hitchcock-- heck, even Michel Therrien wasn't good enough for them. No, Lou Lamoriello went with former Florida Panthers coach Peter DeBoer to be the new bench-boss in the Swamp. DeBoer didn't have much success while in Florida, but he also didn't have the guns to really make a huge splash. With the Devils, he'll have a solid line-up and should be able to show his meddle in the big leagues. Chris Osgood called it a career, finishing his career with 401 wins and three Stanley Cups. While he did have a solid career, are his numbers good enough to get him into the Hockey Hall of Fame?? Personally, on merit alone-- the Cups and wins gets him in; but not as a first-ballot guy. While he could slip in there on the first one, I still think there's a lot of guys who are more worthy than Osgood. He'll get in one day, but I don't think it'll be right off the hop. This week, the profile of a man who lived a great hockey career, but had it unceremoniously ended due to health issues and then had his own mortality shorted from the same condition. It's A sad tale, but more a reflection on the life that he did lead on the rink. This week, the profile of Bruce Gamble. Gamble's assent to the pros started with the Thunder Bay Junior League, which was a Junior A league. Gamble played with the Port Arthur Bruins in the 1952-53 season playing in 11 games with a 7.40 GAA. His role would expand in the 1953-54 season with the Bruins, going 20-15-1 in 36 games. While he didn't play in the 1954-55 season, Gamble returned to the TBJHL, but with the Port Arthur North Stars in 1955-56 playing in 31 games and compiling a 19-10-2 record, then going 8-1 in the playoffs to help capture the TBJHL title. Gamble and the North Stars would go 7-6 in 13 Memorial Cup playdown game, losing to the Regina Pats in the Abbott Cup Finals. Gamble would move onto the Ontario Hockey Association's Guelph Biltmores for the 1956-57 season, playing 40 games with six shutouts, then getting them to the Memorial Cup playdown, though only going 1-4. Gamble returned to Guelph for the start of the 1957-58 season, going 13-32-5 in 50 games, but he would be loaned out to the Ottawa-Hull Junior Canadiens, where he would go 10-3 in the Memorial Cup playdown, helping the Canadiens to win the Richardson Memorial Trophy for the Eastern Canadian Championship; then the Memorial Cup. Gamble would end the 1957-58 season with the Providence Reds of the AHL winning the only game he played in. The 1958-59 season, Gamble would move out West to play for the Western Hockey League's Vancouver Canucks, going 29-26-10 with seven shutouts; helping him win the WHL Rookie of the Year award. However, Gamble would go 2-3 in five playoff games for the Canucks. Gamble was promoted to the NHL with the New York Rangers that season for two games, losing both. The Boston Bruins claimed Gamble in the 1959 Intra-League Draft and sent him to the Providence Reds of the AHL for the 1959-60 season, which had Gamble go 37-32-2 in 71 games, but then going 1-4 in the playoffs. Gamble would play in Providence for 19 games in the the 1960-61 season with a 6-13-0 record, but was still promoted to the Boston Bruins, going 12-33-7 in 52 games. The Bruins loaned out Gamble at the start of the 1961-62 season to the Portland Buckaroos of the WHL, where he would bounce back with a 28-11-2 record in 41 games. When being recalled by the Bruins, he went 6-18-4 in 28 games with the Bruins. Gamble moved onto the Kingston Frontenacs of the Eastern Professional League in the 1962-63 season, going 39-18-11 in the 68 games he played in. The 1963-64 season had Gamble moved to the Springfield Indians by a trade of the NHL-AHL sort from the Bruins and he went 5-12-3 in the 21 games he played in. The 1964-65 season had Gamble get suspended by the Indians for refusing to report to the team, which lasted the entire season. Springfield traded Gamble to the Toronto Maple Leafs ahead of the 1965-66 season, where he would play 10 games in that season, going 5-2-3 in that time. However, he spent most of the season with the Tulsa Oilers of the Central Professional League, recording a 21-24-9 record in 54 games. Gamble would do the split again in the 1966-67 season, going 5-10-4 in 23 games with the Leafs, 2-4-1 in only seven games with Tulsa, then made a stop with the Rochester Americans of the AHL, going 2-3 in five games there. 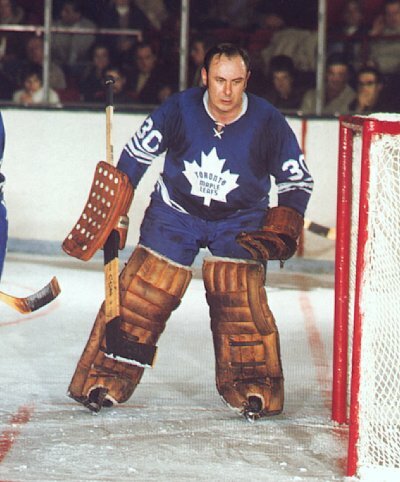 With the expansion era, the 1967-68 season allowed Gamble to stay in Toronto for the season, playing in 41 games and finishing with a 19-13-3 record backing up Johnny Bower. The 1968-69 season had Gamble in the starting role over Bower, playing in 61 games that season with a 28-20-11 record to show, then a 0-2 record in the playoffs. Gamble had a bit of a downslide in the 1969-70 season with the Leafs, finishing his 52 game season with a 19-24-9 record with five shutouts. 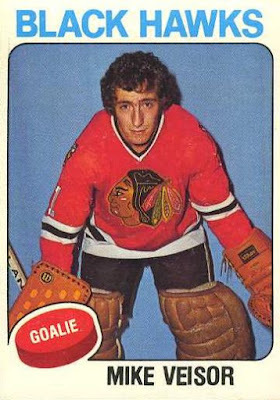 The slide continued in the 1970-71 season with Jacques Plante coming onto the scene in Toronto, Gamble only went 6-14-1 in 23 games before he went on his way out. The Leafs would trade Gamble to the Philadelphia Flyers for Bernie Parent. The end of that season with the Flyers, Gamble went 3-6-2 in 11 games. The 1971-72 season was a short-one for Gamble-- going only 7-8-2 in 24 games before his season immediately shut-down. On February 8th, 1972-- Gamble was in net for the Flyers against the Vancouver Canucks in a 3-1 win. After the game and after reaching Oakland with the team, Gamble complained of chest pains and was sent to an Oakland hospital. It was found out that Gamble had suffered a heart attack during the Vancouver game and with this heart attack, it ended his career abruptly. Ten years later, after a practice with the "old-timer" team, the Niagara Falls Flames, Gamble had chest pains again and passed away in a Niagara Falls hospital at age 44. There seemed to be a roller coaster of events during his career, but Gamble kept plugging away and probably could have done much more if not for his health. He persevered and knew where he wanted to be and would accept nothing less. He did what he loved and gave his all to the game. Traveling this past week or so has been the reason for the delay on new stuff-- so apologizes or something. As the introduction of the new Florida Panthers happen, the questions will always come up about how this new team could actually make an impact and whether or not they will actually be worth all this spending to get to the salary floor. In all honesty, I think a lot of people are rooting for them, but with the guys they brought in for how much they brought him in for-- there's not a lot of hope for this team. This team is an expansion team for a second time. There's no way around it, but with what the Panthers have done, they will have to learn to how to play together and have to form some kind of chemistry in a short period of time in order to be somewhat competitive. In the early going, you have to think they may have a rough time about it; but they could throw some other teams off because you won't know what's going to happen when them-- though trying to sustain that for the long-term is the real task. It was a necessary evil for the Panthers to do, however. With the team being wreck from previous GM's tenures; they don't have any "homegrown" talent. The guys they did have who they groomed from the start are off to greener pastures-- whether it's because the GM at the time didn't like them and traded them out or if they didn't feel like dishing out the money to keep them there-- something went wrong. I doubt that Dale Tallon fully expected to spend like a sailor on shore leave with this free agency season-- but at the same time; he had to. He was damned if he did, damned if he didn't in all honest. If he didn't go on this spree, people would be on his case and the Panthers case for not caring. He did make these moves and people are wondering why the hell he gave such big contracts to menial players for big dollars. The contract length is something I can totally understand, but maybe-- just maybe-- they're giving their newly stocked prospects a chance to grow and learn the system before rushing them into the line-up-- which could be worse than inflated contracts. Odds are, with the younger kids (if they were around) they would be as bad as the veterans they signed and lack the chemistry these new Panthers would have. Plus, there's no guarentee that any of the younger kids would pan out in the NHL style and speed of play-- which could also be worse due to the fact that it could ruin their mentality when playing; being more destructive in the long-run. While the idea is if a team can't hack it, they should be moved or even eliminated from the league-- which I think should happen-- the NHL won't do it and the NHLPA won't agree to it because it would eliminate many jobs and ruins a lot of the market the NHL has built up. The Panthers, along with the Phoenix Coyotes, are prime examples of why there should be NHL contraction-- mostly in a business sense. It has nothing to do with on-ice product (at least in Phoenix), but the mismanagement that happens off the ice-- that's what kills it for everyone and makes the common fan look down on the organizations; if they even pay attention to them at all. The bottom-line is that the Florida Panthers, from pillar to post-- were and are in a bit if disarray. While they had some kind of building blocks come their way in the past couple days (Keith Seabrook, Sergei Shirokov, and Angelo Esposito), it's nowhere near what they could have had if they keep and grew their talent from back in the day....or did, but didn't want to dole out the money when contract time was up. Granted-- two of those three names I mentions have bounced around many organizations-- which shows that it's probably going to be even harder to develop because they can't hack it with any team much less this one. Best of luck to the Panthers-- because they'll need it. To celebrate the Fourth of July in the United States, it's time to profile a guy who many people had high-hopes for coming off a solid Olympic performance in 1992. Yet, at the same time-- as it always does with these-- one thing happens to ruin the greatness that could have happened. This week, the profile of Ray LeBlanc. Though he grew up in Massachusetts, LeBlanc played his Junior "B" hockey in Ontario, Canada; starting with the Markham Waxers in 1982-83, playing in only six games with a 2-2-1 record, before going to the Dixie Beehives in the same season, finishing with a 16-8-3 record there. The 1983-84 season saw LeBlanc head to the OHL to play for the Kitchener Rangers, going 39-7-1 in 54 games, then 3-1 in the Memorial Cup (which Kitchener hosted), with his only loss coming in the final game. After that, LeBlanc moved onto the Atlantic Coast League, playing for the Pinebridge Bucks for 40 games in the 1984-85 season, going 18-21-0 while gathering Second Team All-Star honors. The 1985-86 season had LeBlanc played with the Carolina Thunderbirds for 42 games, compiling an astonishing 33-9-0 record, including three shutouts. The Thunderbirds would go on to win the Bob Paine Trophy as ACHL champions. LeBlanc got First Team All-Star honors that year, as well. LeBlanc would move onto the IHL in the 1986-87 season with the Flint Spirit, playing in 64 games with a 33-23-1 record before going 1-3 in four playoff games. That season, LeBlanc got Second Team All-Star honors and won the Ken McKenzie Trophy for US-born Rookie of the Year. LeBlanc would be back with Flint in the 1987-88 season, where he would play 62 games with a 27-19-8 record, while going 10-6 in the playoff; getting the Spirit to the Turner Cup Finals, but losing out on it. LeBlanc started the 1988-89 season with the Spirit, going 5-9-0 in 15 games before moving along to the Saginaw Hawks, finishing there with a 19-7-2 record in 29 games. LeBlanc also made an AHL appearance with the New Haven Nighthawks in a no-decision. With him sporting his wear, the Chicago Blackhawks thought they would give LeBlanc a chance and signed him to a contract in the summer of 1989. The 1989-90 season has LeBlanc back in the IHL, but with the Indianapolis Ice for 23 games, going 15-6-2 before being shuffled off to the Fort Wayne Komets for the rest of the season, going 3-3-3 in 15 appearances. The 1990-91 season had LeBlanc do the reverse, starting with Fort Wayne for 21 games (10-8-0), then moving to Indianapolis for three games (2-0-0). 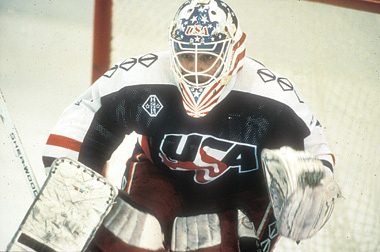 The 1991-92 season saw LeBlanc start with Indianapolis, playing 25 games with a 14-9-2 reocrd before taking a leave from the professional route in order to play for the USA in the 1992 Olympics. In tuning up with the US National Team, LeBlanc went 5-10-1 in the exhibition games. While it wasn't looking bright, LeBlanc turned up his game in the actual Olympics, going 5-2-1 in his eight games, including two shutouts; as the Americans finished 4th in the Games. When LeBlanc returned, he was placed into the line-up for the Chicago Blackhawks later in the season, winning against the San Jose Sharks. Yet, while it may have seemed like a nice gesture; it seemed that the Hawks had ulterior motives. With an Expansion Draft looming, each team had to make a goalie available from their roster if they had played one game. Not wanting to expose Ed Belfour, Jimmy Waite, or Dominik Hasek; this game was the game for LeBlanc to be the odd-man out. However, LeBlanc was not chosen for that Expansion Draft. LeBlanc would return to Indianapolis in the 1992-93 season, posting a 23-22-7 record in 56 games, but then 1-4 in the playoffs. LeBlanc played only two games |(0-1-0) in Indianapolis in the 1993-94 season, before being shipped to the Cincinnati Cyclones, finish the year with 34 more games and a 17-9-3 record before being doomed in the playoffs with a 0-3 record in five games. The Chicago Wolves signed LeBlanc for the 1994-95 season, which saw him get into 44 games, finishing with a 19-14-3 record before going 0-3 again in the playoffs. LeBlanc got limited time in the 1995-96 season with the Wolves, playing only 31 games and putting up only 10-14-2 record. The 1996-97 season had a little more to offer for LeBlanc, getting in 38 games with a 15-14-2 record; then going 9-3-0 in 14 games of the 1997-98 season before moving along to the UHL's Flint Generals for 29 games of the 1997-98 season, finishing 12-4-5 in Flint. LeBlanc moved a bit higher in the 1998-99 season, going to the ECHL's Jacksonville Lizard Kings, where he would play in 53 games and finished with a solid 29-19-1, but would go 0-2 in the playoffs. With one more kick-at-the-can in the 1999-2000 season, LeBlanc went 22-25-8 in 56 games, but would retire after that season. Not much has happened from LeBlanc since his playing days, but he did become a Born-Again Christian in 2008, joining the Calvary Church. While he did seem to have promise, he only saw one game of NHL time and it was to expose a loophole in the NHL's plans. While it is more than most people get, LeBlanc at least gets the recognition of being another USA goalie who flew under the radar during the Olympics, but couldn't translate that into a solid NHL career. Say what you will about the on-ice results, but the moves the Washington Capitals have made this off-season have been nothing short of spectacular. Most of that can be credited to the slyness of one General Manager George McPhee; or GMGM, as the kids call him. First off, it started with the firing of Arturs Irbe and bringing back Dave Prior as the goaltending coach and Olaf Kolzig as the assistant goaltender coach, probably laying the ground work for Kolzig to take the reins later on down the line. That was also something that set-up Semyon Varlamov to get dealt, since he had fallen behind Michal Neuvirth and even Braden Holtby; but there was no deal for Varlamov in June. Fast-forward to the Draft, where there wasn't anyone the Caps wanted, so GMGM made the move to give up their 26th pick in the first round to the Chicago Blackhawks for Troy Brouwer. That's a move that kind of solidified the end of Matt Bradley's tenure in DC, but Brouwer is a guy who has playoff experience at a young age, that it could help the team-- if they can get him signed. 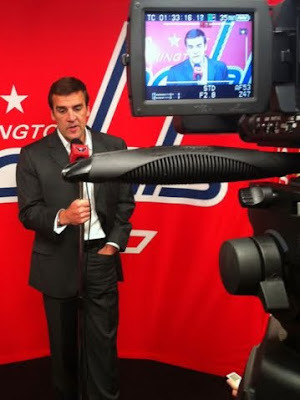 Move a couple days ahead, and some people say this was a little bit of a slip-up, giving Brooks Laich a long-term deal for big dollars to keep the fan-favorite in Capitals red. In the end, with the cap going up and salaries probably doing the same-- it could end up being a steal when all is said and done. However, at the moment-- it doesn't play out to some fans liking. Then July happened....and GMGM got cold-blooded. It started off for GMGM by signing old Capital Jeff Halpern to a one year deal, bringing in some leadership that some thought was lacking in the dressing room. Then, he signed Joel Ward, a gritty forward, from Nashville for four-years, then got a veteran defenseman in Roman Hamrlik for two years, probably to help mold the younger defensemen on the squad. But that was not the biggest move of July 1st for GMGM. I don't know if it was knowing there was desperation or if it was his cutthroat ways-- but McPhee got rid of Varlamov and sent him to the Colorado Avalanche...for a 1st Round Pick in 2012 and 2nd Round Pick in either 2012 or 2013; the Caps choice. The 2012 Draft is supposed to be much, much, MUCH deeper than this year and with the Avalanche possibly being as bad as they were last year-- could be a HUGE pick-up for the Caps. 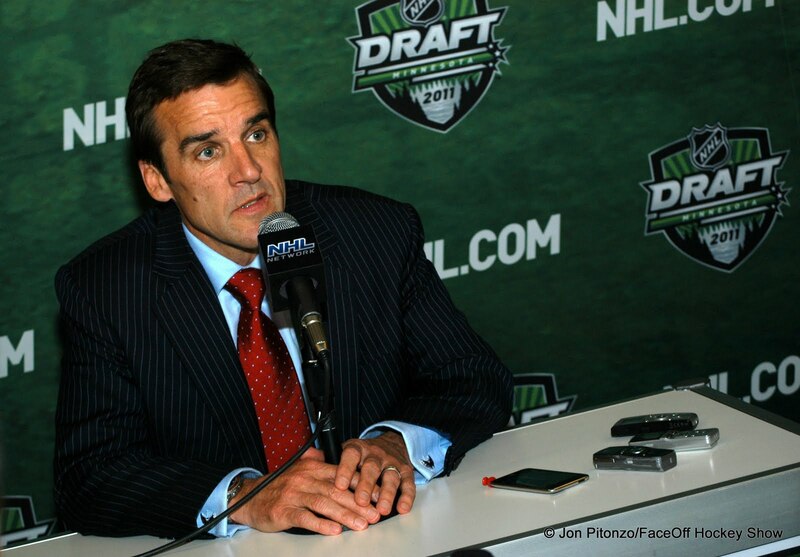 While many thought that GMGM could be mad to go with two rookies in the NHL.....July 2nd, McPhee addressed that-- by signing the highly touted free agent goaltender Tomas Vokoun to a one year deal....worth $1.5M dollar, which is a paycut of over $4M from last season. I don't know what voodoo McPhee did to make this deal happen; but he could have pulled off the biggest shock of the free agency period. Not only does Vokoun provide a veteran presence and can stop a lot of shots; but he'll be able to mentor his fellow Czech Republic native, Neuvirth-- which could prove very invaluable down the line. However, with only $500k left of their cap, you can bet that McPhee will probably deal someone to free up some space and sign the likes of Brouwer and bring up some of the guys from Hershey to try their hand-- but at the same time; he's done a lot of amazing things in order to make his team better and get all the parts he thought was missing and got them ousted early for the past two playoffs. The pressure is on the team and coaches now, though. GMGM has done his part and you really can't fault him too much for the results that happen on the ice. Yet, with the group he's compiled, it's almost to the point where not much could go wrong unless the chemistry just goes awry. But, if he does get the brunt of any failure, he can definitely fall back on his new stand-up comedy career, as you see here; working out material during a press conference. Every now and again, I'll decide that it's a chance to test out the whole "Good Idea, Bad Idea" thing. Can't tell you when's the last time.......probably if I were more apt to searching my tags I would find it...but alas, here we are. In any case, at Noon Eastern today, the Free Agency bonanza begins and there's going to be a lot of people aching to hear who goes where and for how long. Sometimes it's good to deal with the reaction of people-- but more often than not-- it's a drag. Luckily for you, I've decided some good ideas and bad ideas when it comes to dealing with free agency happenings-- hence, the name. GOOD IDEA: Keeping track of what you're team needs: It's one thing to go after a guy who just desirable to the rest of the league; but in the end-- reality has to set in. So long as you understand the role the player you pick up will play in the grand scheme of things-- the better you'll feel about the terms of the deal. BAD IDEA: Flipping out over what other teams get: Sure, it's nice to "Keep up with the Browns," but in the end-- I think there is more stress when you worry too much about what everyone else is doing to the point where you judge what the hell your rival is doing. Sure, you can really bash on thing or another-- but at the same time; remember the first "Good Idea" and think if that'll help their team; then you can be angry if it does help them. GOOD IDEA: Enjoying the banter that is in chat rooms and Twitter: This is a long, drawn-out process and you'll need to coziness of friends and colleagues to get through the boredom if you're staring at the screen. Plus, you could meet new people along the way through such things-- which is always a good idea. BAD IDEA: Taking chat rooms and Twitter as gospel: We've been through it in trade deadlines, drafts, and last year's free agency-- but we've all been duped many a time through fake rumors or fake Twitter feeds and people not doing the 10 second check-up on the reality of the situation. I know we all want to be the first to know-- yet, it's best to be accurate than quick (that's what she said). GOOD IDEA: Watching guys like Jaromir Jagr and Brad Richards in what they're doing: These guys are the big names and are going to headline whatever happens on July 1st or whenever they sign. They have the ability to change a team if they're in the right situations, as well as sway other free agents one way or the other. BAD IDEA: Watching guys like Jaromir Jagr and Brad Richards in what they're doing: This will drive you mad. The fact of the matter is that if they don't sign by 12:01 PM of July 1st; people will have that great knee-jerk reaction of why haven't they sign, because it could take days. They may be the premier names of this FA class; but they aren't the end-all, be-all. GOOD IDEA: Tracking the salaries: This is great in the cap system because you could see guys take less money to put themselves in a better situation to win the Stanley Cup. The fact remains that since all the guys are going for the same goal; it's harder to demand a big salary if you want to be on a contender. That's just a few and probably craptastic reasons to even remotely look at when it comes to the first day of Free Agency, known as Free Agent Frenzy. It should be fun and it should be good times to see who goes where-- especially in a shallow pool like we have.